TS Pull Down chuck now in smaller Size 135mm. 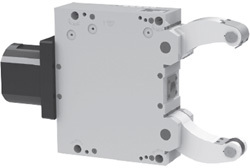 SMW Autoblok high precision Pull Down chucks TS-C [Self centering] & TS-CP [Compensating] are now available in 135dia. Size. The small size allows machining of small component at higher speed, increasing the productivity. Steady Rest Now Available Upto 910mm Clamping. 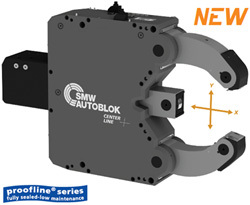 SMW Autoblok has now come up with a Premium Line Compact Steady Rest with Big clamping range. Additional pivoting upper arm for loading & unloading of component. Completely sealed body with integrated coolant or air flush through arms. 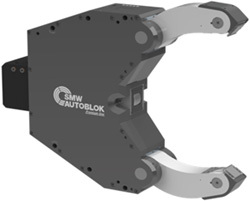 SMW Autoblok Launches new line of Steady Rest ECONOMIC CLAMPING │ Top price - first quality! SMW Autoblok has now come up with Basic Line Steady Rest; these are the economical model with high quality features compared to other steady rest in the market. These steady rest are now available in SLU & SLU-A series. Quick Change from 3 point contact clamping to 6 point clamping. 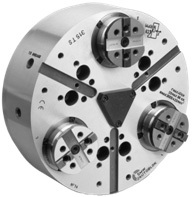 The PJC pendulum jaw for the KNC-S chuck which provides a cost-effective solution to change from a 3-point clamping to a 6-point clamping rapidly. Reduction in Deformation of Component due to 6 Point contact. The jaws are protected against dust and swarf penetration by using a seal. Hard clamping inserts with serrated clamping surface and soft clamping inserts (to be bored on the chuck) available. The PJC pendulum jaw kit is available for quick jaw change chucks size 200 to 325mm as from now! Autoblok has now extended the APL Series Chucks upto 1000mm. Now the Long Stroke Sealed chuck will be available in sizes from 215mm to 1000mm. Along with APL Autoblok has also extended NTL chuck series upto 1000mm. NTL chucks are Completely sealed chuck with centrifugal compensation feature. The chucks are now available in Sizes from 260 to 1000mm. New Product even more advanced. Suitable for Train Wheels or similar. The only in market with effective centrifugal force compensation system to maintain gripping at high speeds. Sealing system not making it hermetic, but allowing the chuck to be pressurized to avoid coolant and swarf penetration. Horizontal & Vertical micrometer Fine Adjustment of Turning Center. Adjustment of Heavy Workpieces center line while clamped. Proofline Series – Fully Sealed – Low Maintenance. Locking of Steady Rest Position via. Locking Mechanism. Fully Interchangeable with SLU- X & SR series.